F&M Men’s Lacrosse (No. 19) improved to 2-0 in the Centennial Conference after upsetting No. 7 Gettysburg 13-8 this past Wednesday, March 27. To start off the game, Connor Hunt won the face-off for the Bullets. Hunt quickly passed upfield to Brian Kolen who scored Gettysburg’s first goal, only six seconds into the game. Sophomore Jack Beatty won the second face-off against Hunt to give the Diplomats possession. Sophomore A.J. Rigsby took the first shot for the Diplomats, but a nice save by Scott Macmillan kept the score 0-1. With ten minutes left in the first quarter, the Bullets attempted two shots on goal, one went wide and the other hit the post. After junior Jarrett Donaghy picked up a ground ball, the Diplomats forged ahead after a successful clear attempt. First-year Blake Target scored the first goal for Franklin & Marshall, assisted by senior Tucker McBride. With eight minutes left in the quarter, Gettysburg’s Kadin Kightlinger scored a goal against sophomore goalkeeper, Luke Mutterer, putting the Bullets up 1-2. The Bullets scored again at the five-minute mark after two failed clear attempts and a turnover by the Diplomats. Gettysburg’s Kolen was assisted by Michael McCormick to make the score 1-3. This time, the Diplomats responded quickly after first-year Noah Isaacson forced a Gettysburg turnover. After a successful clear attempt, junior Kevin Mollihan scored for the Diplomats, assisted by Donaghy. Mollihan, assisted by sophomore Luke Keating, tied the game up 3-3 with his second goal of the game with 2:44 left in the quarter. Neither team was able to score for the rest of the half. Similar to the first quarter, the Bullets got off to a hot start. Eight seconds into the second quarter, Gettysburg’s Blake Gray, who was assisted by Kolen, put the Bullets up 4-3. For five minutes, both teams went up and down the field, having unsuccessful offensive attacks. However, after a nice save from Mutterer, followed by a successful clear attempt, first-year Spencer Hall netted a goal for the Diplomats, re-tying the game at 4 points apiece. After a slashing penalty against Gettysburg, F&M had the opportunity to score with one man-up with six minutes left in the half. The Diplomats took advantage as Keating scored, assisted by McBride, giving the Diplomats their first lead of the game. The Bullets once against responded with a goal at 3:53 by Kolen, assisted by McCormick. The Diplomats tacked on one more point as Target scored the final goal of the half, assisted by McBride, putting F&M up 6-5. Going into the second half, both teams knew the winner of the back-and-forth battle would be the team who did not give in. To start the third quarter, the Diplomats scored first with two minutes into the half. After a successful clear attempt, McBride found the net to put the Diplomats up by 2. After an offsides penalty by the Bullets, the Diplomats scored at the 11:10 mark with their man-up advantage. Keating scored his third goal of the game, assisted by senior George Briggs. The Diplomats scored again nine seconds later, as Mollihan shot the ball into the net, putting the Diplomats up 9-5. After a frazzled Gettysburg took a timeout to regroup, they scored at the 9:40 mark. However, F&M responded once again with Mollihan’s fourth goal of the game with seven minutes left in the quarter. Neither team was able to score for the remainder of the third quarter, keeping the Diplomats in the lead with a score of 10-6. 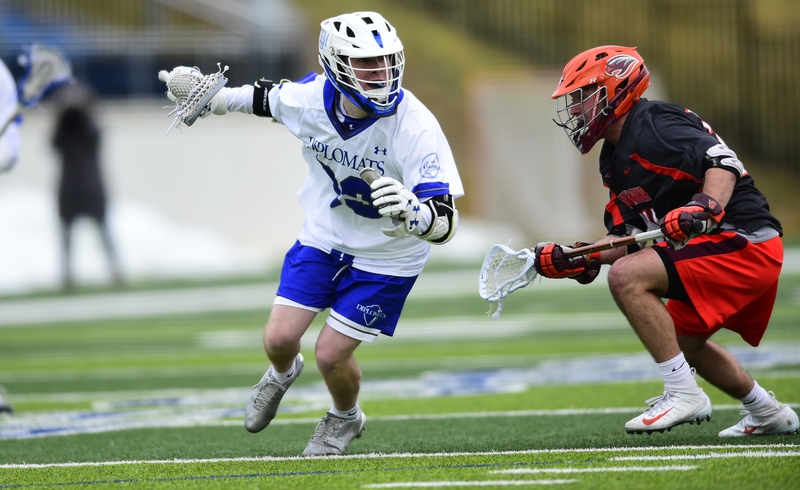 Keating scored the first goal of the first quarter for the Diplomats. After a holding penalty on the Diplomats, the Bullets were able to respond with a goal by Andrew Garstka with eight minutes left in the quarter, keeping the score within four points. The Bullets made the score 11-8 with another goal by Jack Fletcher with five minutes left in the game. However, the Diplomats made the final attack as Donaghy (assisted by McBride) and Beatty scored one goal a-piece, which cemented a 13-8 score for the Diplomats with four minutes left to play. The Diplomats’ strong defense prevented the Bullets from scoring for the remainder of the game. Mollihan was the leading scorer for the Diplomats with four goals. McBride led with four assists. Goalkeeper Mutterer had 10 saves. The Diplomats will compete against Elizabethtown at 7:00pm at home on Friday, April 5.